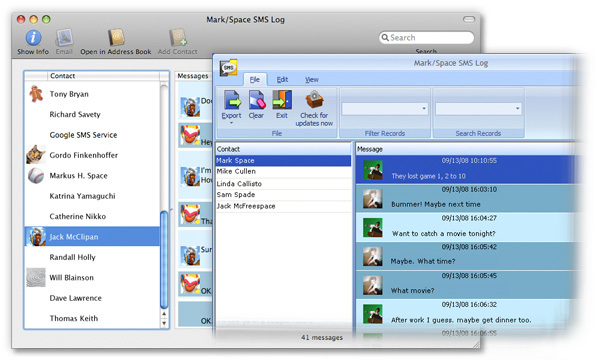 The Mark/Space Blog: Mac SMS Log App Update - Faster! Today we released a minor update to the Mac version of Mark/Space SMS Log, which is a companion app to our Missing Sync line of products. The SMS Log application keeps an archive of text messages of your various phones, allowing you to search, display, and review your mobile phone texts. It has been a while since we updated the app, and most of the changes are in support of the latest versions of Mac OS and iOS, as well as a very nice performance/speed boost when the app starts up for those with large archives. To download the latest version, just run the SMS Log app and pick "Check for Updates" inside the app (Mac version).